T-bone steaks always look impressive on the plate. This preparation includes Parmesan and garlic in the coating. Combine seasoning ingredients. Remove 4 teaspoons; press onto beef steaks. Add cheese, oil and vinegar to remaining seasoning; mix well. 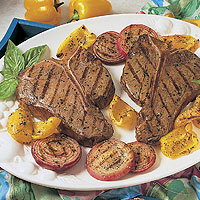 Place steaks in center of grid over medium, ash-covered coals; arrange vegetables around steaks. Grill steaks, uncovered, 14 to 16 minutes for medium rare to medium doneness, turning occasionally. Grill bell peppers 12 to 15 minutes and onion 15 to 20 minutes or until tender, turning once. Brush vegetables with cheese mixture during last 10 minutes. Carve steaks. Season with salt and pepper. Serve with vegetables. To broil, place steaks and vegetables on rack in broiler pan so surface of beef is 3 to 4 inches from heat. Broil 15 to 20 minutes for medium rare to medium doneness and until vegetables are tender, turning once. Brush vegetables with cheese mixture during last 3 to 4 minutes.